An early season blackcurrant variety, Ben Sarek carries attractive and juicy large berries on short strings. 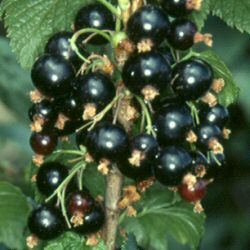 In addition, it is renowned as a heavy cropping blackcurrant. As an additional benefit, Ben Sarek has good frost and disease resitance, thus making it a good choice for the more northern parts of Britain.